Mega movie [Painted Skin] is currently undergoing filming in Hengdian. Recently, we visited the filming site, and saw the screen personas of Chen Kun, Zhou Xun, Zhao Wei and Donnie Yen. In the movie, Chen Kun’s character is a famous general, while Zhou Xun’s portrayal of the female ghost oozes eeriness. During filming, Donnie Yen nearly injured himself. Because of the filming, Han Street in Hengdian tourist spot remained closed. Stars like Donnie Yen, Zhou Xun, Zhao Wei, Chen Kun and Sun Li have been participating in the filming, and as the story evolves around ghosts, night scenes featured heavily in the movie. On 4 January noon, we reached the filming site, and found that all entrances to the site were closed. Production crew needed to display their passes before they were allowed entry. Originally, there was a footpath on the northeastern part of the Han Street castle, where tourists could walk up and admire the scenery at the top of the castle. The production team had also blocked the footpath by wooden planks. At one glance, one could see that filming was earnestly underway in the castle. We could see many people milling around the site, and they seemed to be extras for the city street filming. About half an hour later, actual filming commenced. We saw Zhao Wei decked in her screen attire, which was a white overcoat, and she was having a very dated hairstyle, with her hair bundled up. The image was that of a graceful lady, and it was very different from her role of Sun Shangxiang in another epic movie [Red Cliff]. Standing beside her was a man decked in general attire. After the director shouted, “Cut!”, the ‘general’ turned back, and we realized that the actor was not Donnie Yen, but Chen Kun. At this moment, a female actress dressed in a white robe with a black headdress walked towards the filming site. 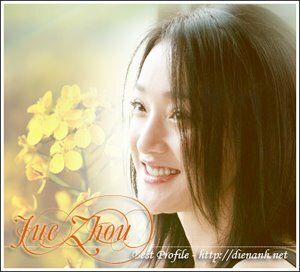 At close glance, we found out that she was Zhou Xun. She had a focused expression on her face, as if she was concentrating on what she needed to do for her next act. This ‘female ghost’ has indeed brought creepiness to the scene. On the second night, we ventured to Han Street again. Perhaps the tourist city was closed to tourist visitors, we saw that the previously boarded doors were open. We stepped into the filming site again, and saw that the crew was mingling at nearby buildings, meant to be inns and monasteries. The exterior of the buildings were painted a deep beige colour, and it felt specially creepy at night. We crossed over to the back door of the monastery, and were nearly frightened by the scene that greeted us. There were two large portraits, a bronze mirror and some makeup items. So this was here Zhou Xun stayed to ‘paint her skin’ to transform herself into a beautiful lady. That night, the team was supposed to film a scene of Swordsman Donnie Yen. This scene was supposed to be filmed on the rooftop of the second level of the inn. However, we saw Donnie sitting by the director all the while, while two artistes were ‘flying’ all over the rooftop. It appeared that one of the artistes was his double. The other person had a fierce and sinister looking expression, and should be Donnie’s screen enemy. The entire site was alight by the projector lights, and there were several film records held up by cranes, which zoomed here and there as the artistes moved. Donnie was chatting animatedly with some makeup artistes. We learnt that he nearly had an accident during filming two days ago. At that time, he was also supposed to film a night scene at height. At the last moment, Donnie felt unwell, and decided to let his double do the stunts. His instincts proved accurate, when the double accidentally fell to the ground. Donnie was pretty shaken up by the incident. The story [Painted Skin] has been modified several times, but he main focus was still that of a weak scholar’s encounter with a vicious female ghost. However, it appeared that the latest version had more changes. In the original story, Chen Kun’s character is that of a weak scholar with a fondness for females, and needed the protection of priests. After the female ghost killed him, he needed his wife to resurrect him. However, in the movie version, Chen Kun’s character is a strong general. In fact, he would have several horse riding and fighting scenes. It is anyone’s guess as to how the story would develop further. A few days ago, Zhou Xun, Zhou Wei and Sun Li had filmed a scene at the temple. In the movie, Sun Li is Zhao Wei’s good friend, while Zhou Xun also has a close relationship with the duo. We also learnt that Sun Li’s character is a good friend of Donnie Yen, and she is a swordswoman with brilliant martial arts skills. Sun has already done some of the stunts herself. Although Zhou Xun did not need to display any fighting skills, she was required to display the aggressiveness and terror of a lady ghost, and her might would be enhanced during post-production.